Consisting of Georgia red clay. Great for filling in areas or raising up natural areas at a low cost. Unscreened. Local earth with some rocks and roots. Cheap and ideal for large areas or projects needing only minimal quality soil. 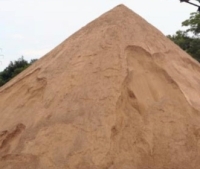 A screened version of our standard top soil. Offers a cleaner soil with a cheaper price. Good for almost any project. 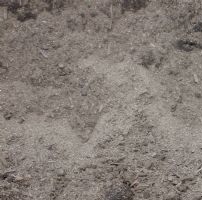 A premium screened soil. Consistent soil texture. Provides neutral pH. Great for any job in the yard or garden. Perennial's need just the right pH and texture to optimize growth potential. This soil provides just that with it's amendments. Sure to add color to any yard. Contains compost, sand, ERTH food, and humus. GA's special blend of topsoil, compost, and the right amount of sand. A gardener's delight as well as great for any other planting project. 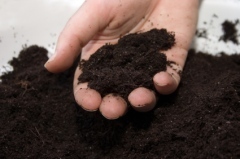 Manure, plant, or animal wastes used as fertilizer. 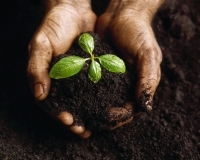 Rich in humus (decaying organic matter), manure releases many important nutrients into the soil. However, manure is deficient in three important nutrients: nitrogen, phosphorus, and potassium. A commercial fertilizer has about 20 times as much nitrogen, phosphorus, and potassium as an equally massive amount of manure. For this reason, manure is often used in conjunction with other fertilizers. Manure also helps to loosen soil and retain water. 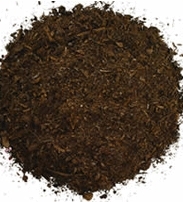 An incredible organic fertilizer and soil conditioner; great for use as a mulch or mixing in any garden, flower bed, or even for use as a top dressing. Humus and aged pine. Standard use amendment. Just the right blend of top dressing sand and ERTH Food. Is your yard level? Probably not. Why not use what the PGA uses? Lawn Mix. This top dressing sand and ERTH food mix provides nutrients as well as leveling capabilities in one easy mix. Also good when prepping for sod. Why is Georgia's soil red? Not all of Georgia's soil is red, but many of them are. 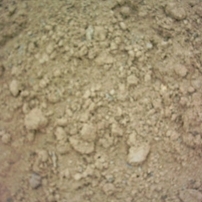 The State is well known for its abundance of "Georgia Red Clay". People often ask why the soil is red. The red color that is so evident in Georgia soil is due primarily to iron oxides. Soil form from the interaction of climate, organisms, parent materials, relief, and time. Red soil in Georgia result from the affect of a warm, humid climate weathering acid crystalline rocks on rolling hills over a long period of time. 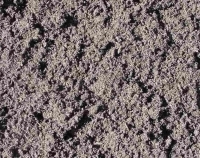 Soil in much of Georgia, particularly the Southern Piedmont region of North Georgia, developed in materials weathered primarily from granite and gneiss. These rocks are black, white, and gray and are relatively low in bases, or natural fertility. Georgia has a climate of warm (hot) temperatures and high rainfall, so there has been intense weathering of the rocks over the years. High rainfall has leached out most of the bases that were present. Materials that remain are composed mostly of iron, aluminum, and silica and it is the iron that gives the soil the red color. The red color is not just from iron, but more specifically from unhydrated iron oxides. 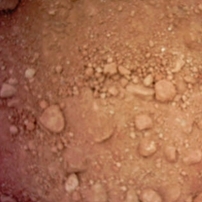 The red soil is generally on convex landforms that are well drained. Organic matter can mask soil colors in some areas. However, organic matter content is low in most of Georgia's soil because of the warm climate, so the red color is not affected by it.